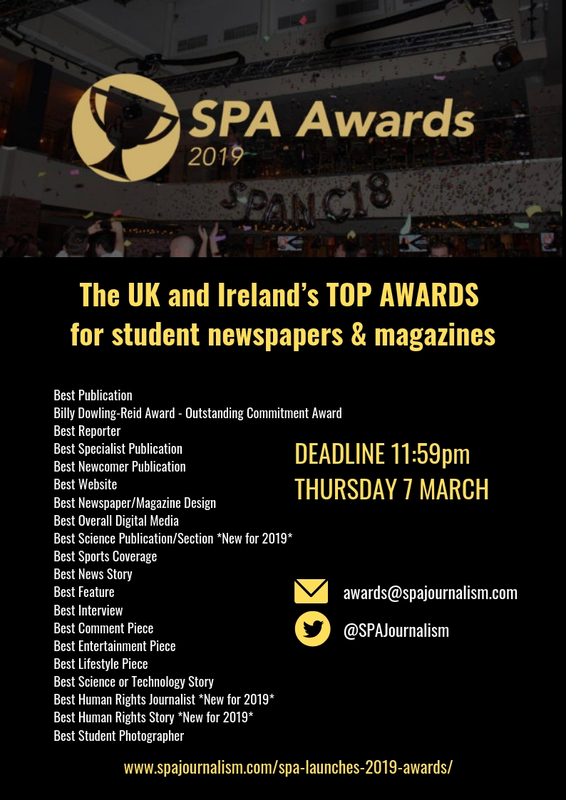 The UK and Ireland’s top awards for student newspapers and magazines are back. With 21 categories, the SPA Awards recognise work at all levels of student publications. This year sees the inclusion of new awards for scientific and human rights journalism, as well as the dedication of our Outstanding Commitment Award to SPA honorary member Billy Dowling-Reid. Results will be announced at the 2019 National Conference at the University of York, with shortlists released beforehand. You can find more details about the Conference, including ticket information, here. Submit your entries via this Google Form. The deadline for entries is 11:59pm on Thursday 7 March. The deadline for entries is 11:59pm on Thursday 7 March. Any work submitted after this time will not be accepted. Only students of the current academic year (2018/19) or who have graduated in the past year are eligible to enter the awards. All work entered must have been published between 16 March 2018 and 7 March 2019 for a student publication in the UK or Ireland. Any publication entering must be a member of the Student Publication Association by the time the deadline for submissions passes.